On Friday, I took a ride involving Seattle, Mercer Island, and Bellevue. 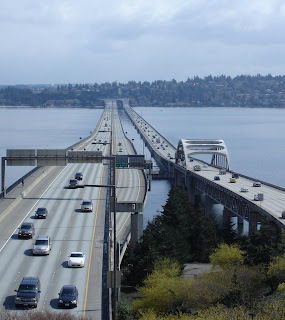 This is the I-90 bridge between Mercer Island and Seattle, looking east. The bike lane on the bridge is truly excellent, and there is plenty of interesting riding awaiting on Mercer Island for future visits. When in the bike lane on the bridge, did you see any other cyclists? Yes - across my trip I opposed perhaps 8 other riders on the bridge, as well as a streetsweeper (!!! ).